Synopsis: Yann Martel's award winning novel is given the cinematic treatment by Academy Award winning director Ang Lee. It tells the spectacular story of Pi, a young Indian boy whose incredible adventure surviving against all odds on a lifeboat with only one other companion - a tiger named Richard Parker - is an amazing journey to witness. I'd be best to start this review with a confession. I am a sucker for a visually driven movie. To me one of the absolute pleasures in viewing a film on the big screen is to bathe and radiate in the glow of gob-smacking, visually dazzling imagery that just takes your breath away. The talented people creating these works of art have a massive canvas from which to entrance, entertain, and wow film fans with astonishingly inventive pieces of cinematic magic. Pi is one of the latest entries into this category for me. What Ang has created is truly special, a film which does the book absolute justice. Author Yann Martel has also endorsed the adaptation of his beloved novel, saying that he always felt the novel was 'cinematic'. He had faith that the right (i.e. most sympathetic) person would realise his vision into something to be shared on a bigger canvas. Early on, three other directors were attached to this project. M Night Shyamalan, Alfonso Cuaron and Jean-Pierre Jeunet. Last two I'd say yep, they would do it justice (More so Jeunet). But Shyamalan? Hmmm... Given his recent past... Think I'd skip it. Having said that, the trailer for "After Earth" does herald a tentative return to form. Then again, how often have you seen the trailer, then saw the movie and tried to figure out how you could join any dots between the two ? Putting the eye-candy aspects to one side, the story (For those like me -unacquainted with the novel prior) delves into many themes about the human condition, covering such topics as love, loss, empathy, faith, survival, perseverance, respect, spirituality, friendship, tolerance, fear to name but a few. What I love about this approach is that it means you find your very own unique interpretations of the images presented - without them being spelled out for you. 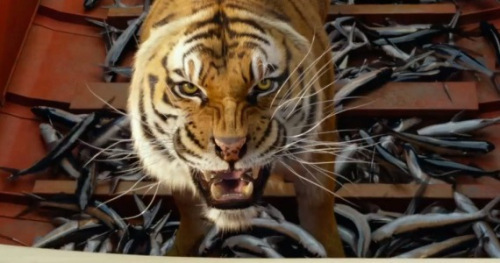 Of course, this tactic will only help solidify Life of Pi's ongoing success. Long after the cinema run has finished, it's inherent charms will be constantly evident via whatever medium viewers prefer.